It has been a while since I have sent a message out about what is happening at the Village Store. But there are so many great new things I wanted to share. > You can buy tickets to the Locust Street Taxi annual Taxi Fest🎻🎺🎼.at the store. It is to be November 19. This year it is to be at Chimicum High School. You don’t want to miss this event. > It is possible now to order your holiday turkey. > The veggies and meats are looking great. > There is enhanced internet service for our guests and new tables and chairs. > The electric car charger is being used more often. > We have a suggestion box and look forward to learning what you want us to carry. > Thanks for your continued support. I hope you all had a great Thanksgiving ….and it seems that Christmas is rapidly approaching.. Is anyone interested in a fresh free range turkey for the up coming holiday? Let me know and I will see if it can be arranged. We went to Greg and Stacey’s for the major event, but I got one of the birds to cook just for us a few days later. I was the best smelling turkey I have ever cooked. And a VERY GOOD cook who purchased one of the free range turkey had this to say " Our free range guy was superb, certainly the most tender and most flavorful of all turkeys past. We really could tell the difference." High priase! > I did make a very tasty avgolemono soup with the stock from the turkey. > This Saturday December 5th at 5 PM will be the Community Tree Lighting near the Post Office…Santa will arrive in a sled, photo op with Santa, cookies and music—all with your friends and neighbors. A fun event. > And the following Saturday–Dec. 12th, There willl be a celebration for the new improved bookmobile…now called a Mobile Library at the Community Center from 2 to 4 —cake and the Village Idiots will be providing music. Another great event for the whole family.. And of course Greg will be playing banjo or some other instument in this lively group. > Hope to see you at these events. Hope you are enjoying this brisk but sunny day. Surprising to me at least, we are in holiday time. > First is Thanksgiving…..you can order your free range, fresh turkey until Monday and pickup starting Tuesday. We have some beautiful whole pies—apple, berry, pumpkin and cheese cakes. As well as cheese cake slices….which are so tasty and great if you are a small family and don’t want (or trust yourself) with a whole cheese cake. We have some of Serendipity’s locally made cranberry sauce. And of course a good selection of wine, cider and liquor if you want some sprint for your meal. FYI Discovery Bay Village Store will be open in the morning on Thanksgiving…not sure yet if QVS will be.–plan ahead. I just spoke to Chris of Serendipity Farm and we will be getting some of their wonderful wreaths to bring some joy to these cool and darker days…BUT she is selling out quickly so if you want one, get it when you first see it. We got in a new selection of the baskets we carry—including a number of new styles. They are so handy…I use one for my knitting. But they are great for carrying anything and make a great gift basket for presents or hostess gifts—fill with some chocolate, wine, cheese and crackers, the hand designed dishtowels or what ever suits your recipient. We have installed an electric car charger…so you can buy that electric car you have been looking at!! Or tell your traveling electric car owning traveling friends. It is located next to the door on the side with the ice machine. And for today’s non recipe…..I will share what we have been having most Sundays for breakfast. Recently I have been starting with a new potato for each of us. The trick i have found useful is to put them in the microwave for a minute per potato…gets them mostly cooked but still firm. While the potatoes cook, I brown whatever is available—onions, celery, mushrooms, red peppers etc in a little olive oil. When potatoes are done, I take them out, dice and toss into pan. Can add some herbs now also….oregano is good. After the potatoes have browned as much as I want, I crack one or two eggs per person over the stuff in the pan and stir until it is all well mixed and cooked. You can add some cheese if you want. I hope you have noticed and like the new landscaping. We are excited to get done and think it make the store more attractive folks driving by. A reminder that you REALLY want to order a turkey ….even though we will be going elsewhere for Thanksgiving I have ordered one just because they have such a good reputation and are so resonably priced for free range turkeys. And to clarify all of the turkeys we will order are free range. They have no perservatives, are fed a vegetarian diet and are never fed antibotics or hormones. Check out Marysturkeys.com. > We also are getting some whole pies and cheese cakes if your sweet tooth needs a treat. > Something we carry that I had never had before is Not Your Dad’s Rootbeer. This is beer that tastes like rootbeer. I really like it…refreshing not too sweet but since I am not a beer drinker, I love it. We also have some great ciders in individual bottles for times you want to grab something other than a beer. > It has been a long time since I gave a recipe…and this will be my usual non recipe recipe. > It started when I had one fish fillet for dinner for two. So I thought I would have to extend it. For lack of a name I will call it Italian Fish. (what I have found is any time I think I have created something unique, if I google I find many similar recipes….so I am sure this is out there) The method would work with chicken, pork or leave out the meat all together…It would not be missed. Use what ever veggies you have on hand. > Chop and saute onions ( I would have added some if I had had any), handful of celery , half a red pepper and sliced mushrooms in olive oil. > I served it over cooked Israeli Couscous. (it cooks in 3 minutes in the pressure cooker–or cook for 8-10 minutes like pasta. > The cous cous was perfect with the sauce. I cooked in the time it took to cook the couscous. Parsley would have been a nice garnish. I have some left overs in the refrig and am going to go eat it now! Some folks have asked for more information about the fresh turkeys that can be ordered from Quilcene and Discovery Bay Village Stores. They are from Marys…learn more at marysturkeys.com. Check it out…you can see video of some happy turkeys pecking in a pasture. I have great great reviews about Marys chickens and turkeys. And to go with your turkey, we are carrying stuffing mix from Pane D’Amore. We have fresh local veggies from Midori and greens and dressings from Serendipity Farms. And of course, finish off your meal with a little chocolate piece from Chocolate Serenade. Feed your family and friends locally for good health, reduced your carbon foot print while supporting local economy—what a great gift to yourself and the world! Exciting news! You can pre-order your organic or free range fresh turkey. Get a turkey who was free range or organic and not have to defrost a factory turkey! Feel good about your turkey as well as get local veggies to round out the meal. Have a great Thanksgiving! > Lg — Sorry, not available this year. > XL — Sorry, not available this year. A $15 deposit is required to reserve your bird. Deposit will be applied to your final sale. All birds will be available for pick up on the Monday 23rd. Turkeys will be fresh with no thawing required. As a sad heads up, we have been told that they may be phasing all ethanol free gas out since it is sold in so few places. We will continue to get it as long as it seems a reasonable price.) We will still have ethanol free regular gas for now. > We have locally grown tomato and other plant starts for your garden thanks to Serendipity, as well as two suppliers of organic GMO free seeds. > Local greens should be coming soon. > We have a new supplier for sweet and savory grab and go meals. Eight Arms Bakery in Olympia makes wonderful stuff!!! The hand pies are really good. Two I have tried are black bean or broccoli and cheese. There are also muffin pies both savory and sweet. We have some of their other baked goods. You will find their items in the grab and go case. We can order anything they make if you let staff know what you want. Here is a link http://8armsbakery.com/#about. > And if you haven’t tried the ice cream at Discovery Bay Village Store….it is time since the weather is warming up. > Enjoy the great weather and eat locally. 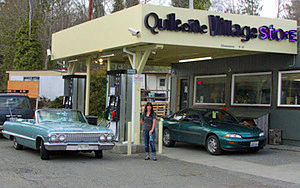 We are located on Highway 101 in the south part of Jefferson County, WA in the town of Quilcene. Quilcene is located approximately midway between Port Townsend to our north and Hoodsport to the south. Brinnon is the closest neighboring town to the south, as is Chimacum to the north.